All about mule shoes - Off Topic - Drive On Wood! I was always told draft animals have shoes with cleats riding animals do not. Interested to know if that bit of lore holds true. Cleated are for animals working in soft ground like the woods is what i was always told they need better traction. Flat is for animals that only do light work where you don’t want the ground torn up. You’ve got that right! When Wayne talks, people listen. What Dan and David said . 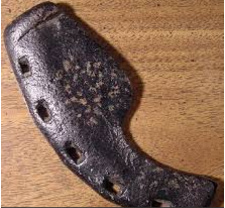 The regular horse shoe usually come with a small cleat at the rear . Racing shoes are flat and aluminum. I have seen some mule shoes with very high hills . At the back of the shoe they were doubled back at the end just over and inch making them double thick at the rear . Think of a mule pulling , the legs and hooves are not vertical but at an angle ( pulling stance ) . I think the hill on the shoes might make pulling a little more comfortable . On another note and years ago. Back in the middle 70s I shod 20 horses in a day . I started that morning with truck head lights and finished having to also use my truck lights I did have a friend helping . He was pulling the old shoes and dressing the hooves after I got the shoes on . Now it would take me all day to shoe one horse . Wayne, its harder work that most people think! Allso, a real test of mans nerves and strengh sometimes! Did 3 horses about 2 weeks ago. Took me half a day. Our horses are heavy strong workhorses, and if she likes so she sends you skywards quite fast. Great article. I have to say tho, being a northerner I have never heard anyone call it “the war of northern aggression” LOL! Very interesting. Just think, 160 years ago we were a country at war with one another… Think of this happening now days and then think about how it must have been to be around during that time. I’ve given this a lot of thought. Fake news isn’t just something that was recently invented. Revisionist history books are written by the victors. In the case of the war between the States, the history books have white-washed the truth. In the 1850—1860s, the States were sovereign and, superior to the federal government. Pres Buchanan resupplied Ft Sumter. later, Pres Lincoln re-garrisoned Ft Sumter against the orders of South Carolina. The FEDs claimed that it was FED property. South Carolina claimed that it was State property. :property. Lincoln illegally re-garrisoned the Ft and waited for a chance to force the South into attacking. The “war of Northern Aggression”| had NOTHING to do with slavery. Lincoln freed the slaves in the South where he had no jurisdiction. He did NOT free any Northern slaves. Charleston and the south were just too rich and, the northern bankers wanted a cut. They imposed the federal GOV to lay on taxes, which it had no right to do. Even Lincoln said. I have General Lee in front of me, and the bankers behind me. Of the 2, I fear the bankers the most. Lincoln clearly claimed that the war was caused by taxes. Like much of American history, it has been sanitized by the victors.